Around 8 years ago, the city of Wellington was in a turmoil. 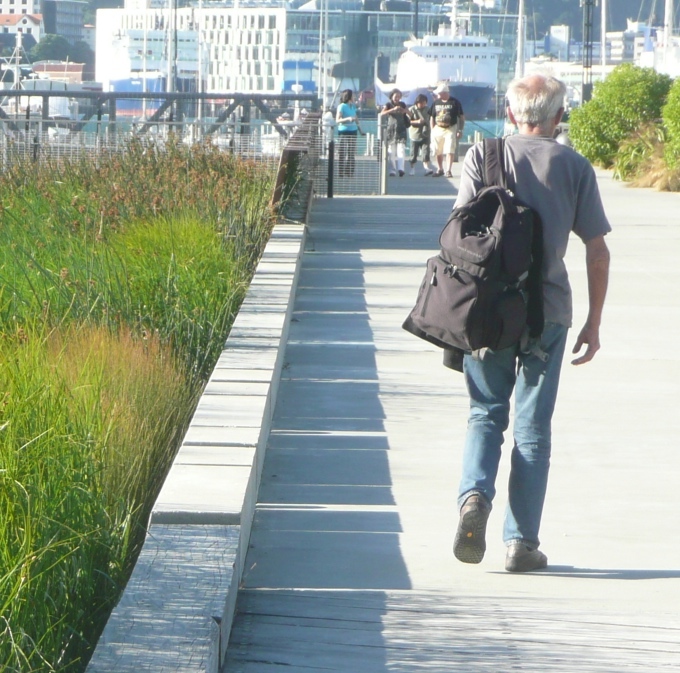 The aged forces of Waterfront Watch, an elderly bunch of Wellingtonians with time on their hands, decided to take on the Wellington City Council over their proposals for the waterfront land. The public was stirred up into a paroxysm of hatred for Variation 17 – what were portrayed as proposals by the WCC to allow building all over the waterfront. 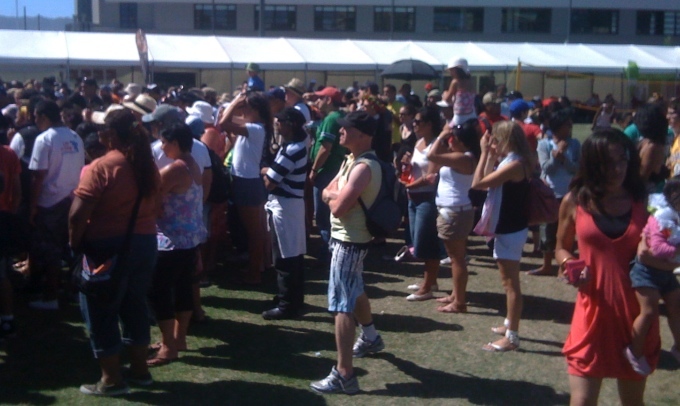 Waterfront Watch were largely successful, forcing the hand of the Council to reduce the scope of their ambitions, and lobbying hard for the creation of what is now Waitangi Park. And well done too – the park is great. But now there’s another proposal on the waterfront. Waterfront Watch are already on the case, formulating a response to the Council’s proposals for the new proposals for Variation 11. There is a discussion started up on this at the recently rejuvenated website of the Arch Centre here. There’s a lot to read, and so far not much response formulated by anyone. Is the Council trying to pull a fast one over our eyes again, as they appear to have wanted to have done way back in 2000 with Variation 17? Or is it just that their PR was crap then, and they let themselves get talked into a corner. Will the new PR guru Richard MacLean manage to smooth the ruffled feathers of the old birds at the Watch, or is he just a smooth talking cover for yet another insidious invasion of what should be public land? Let Waterfront Watch know what you think. Let the Arch Centre know what you think. Heck, even let the Fish know what you think if you like – but most of all, go to the council website and read the documents. Most importantly, let the Council know what you think. But back to the park. Once the winning design was chosen by the Council, unfortunately the Waterfront Watchers went on another rampage against the chosen scheme, lobbying just as hard for the scheme that the public had voted on in preference – a vastly more photogenic presentation with koru spirals, giant tuataras, and more child friendly features. 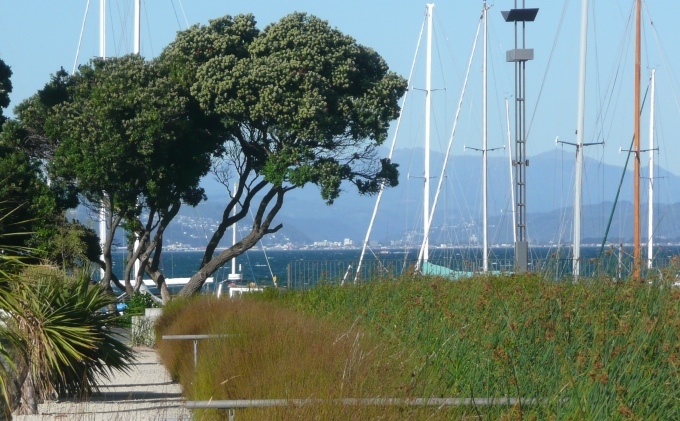 The scheme chosen by the Council looked bleak and uninviting and the model was not doing a lot to sell the scheme – however, the Council advisors stuck to their guns, plumping for the scheme that had a large inviting open space park at the centre and so eventually Waitangi was built. There is masses of bird life and families of ducks are proving that they are quite at home here, as well as the sparrows and finches. There are masses of flaxes as well, so soon we should see a plethora of tui (a murder of crows, a flock of geese, but what’s a plural for tui? a hui of tui?) hanging around the park, like the noisy squawking teenagers that frequent New Zealand’s finest skate bowl. Eye of the Fish thinks that at long last the Council planners and park designers have been proved right: Waitangi Park is something that we should all feel immensely proud of, and the build quality is fantastic – Fletcher Construction of course, after the original contractor went belly up in the soft brown sand. Perhaps it’s time for Waterfront Watch to publicly apologise for their anti-Wraight-Athfield park campaign and admit that they got it wrong and that what has been built is just fine. But I suspect that they won’t. Me, personally: I think the park is doing a great job. there was someone in the paper a couple of years ago that said the reeds would just go mouldy and the water would smell. Glad to see that they have been proved very wrong. Sounds like the usual suspects who are really fuddy-duddy suburbanites who think they’re environmentalists. Probably the type of people who do their bit for Mother Nature by putting “save the planet” stickers on the back bumpers of their Ford Expeditions/Range Rovers.